Lilies are a very common flower often seen in gardens and flower arrangements. 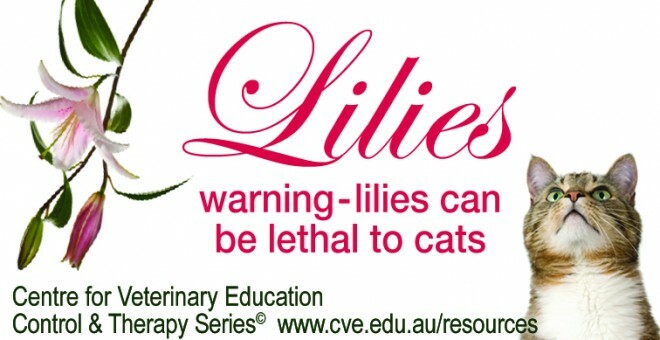 A very scary fact about lilies that people may not know, is that they are in fact extremely toxic when ingested by cats. Every part of the lily is toxic, from the petals, leaves, stems, stamen, pollen and even to the water in the vase. Even licking the pollen or just mouthing any part of the lily, and not even ingesting any of the plant can have fatal consequences. It is best to consider all lilies in the lilium (true lilies) and hemerocallis (day lilies) species as toxic. Within 1-3 days of ingestion acute renal failure (ARF / kidney failure) develops, with the cat displaying dehydration, uremic breath (ammonia like) and often oral ulcers. Supportive treatment includes intravenous fluid therapy and diuresis. If lily ingestion is detected early the prognosis can be good, however once ARF has developed the prognosis is often guarded.